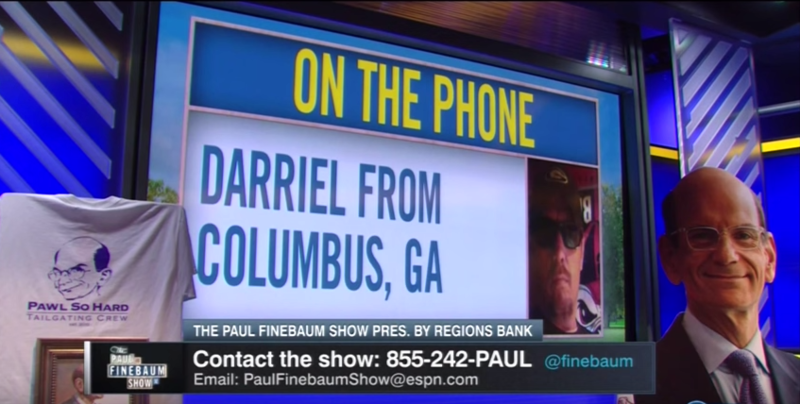 Georgia Super-Fan "Darriel From Columbus" gets taken to the woodshed By Finebaum. Called out for running his mouth for last 9 months, Darriel was scolded by Paul Finebaum for his "pathetic call" and for comparing it to the 6-9 Alabama LSU game of 2011. Even Paul's LSU sidekick, Marcus Spears, wasn't buying the pathetic Bulldog schtick. Darriel then chimed in more and said that the season was "not over" and that Georgia needed to "lick their wounds" for a later rematch. Finebaum answered his "lame effort" defending the Bulldogs by repeating a famous south Georgia phrase, "That dawg don't hunt!" that Darriel has to know all too well... and promptly ended the conversation.